Some people may be allergic to a life-saving medication called epinephrine. But alternatives are available that provide safe treatment in dangerous situations. Another name for epinephrine is adrenaline and it is a hormone that is produced by your adrenal glands. You can't live without it. Which is why it seems odd that rarely an individual can experience an allergic reaction when given epinephrine as a medication. Epinephrine is released from your adrenal glands in response to stress and is responsible for the "fight or flight" phenomenon. It has several effects on the body including making your heart rate faster and boosting the oxygen and nutrient supply to your skeletal muscles and your brain so that you can run away from danger. It also increases your awareness and gives you sharper vision and hearing. Epinephrine is released in response to fear or stress in small bursts and these effects typically last a very short amount of time, just long enough to allow us to survive stressful or dangerous situations. People who do not produce enough epinephrine from their adrenal glands have a condition called Addison's disease which can be fatal if not treated properly. How Is Epinephrine Used to Treat an Allergic Reaction? Epinephrine is used as a medication for life-threatening allergic reactions (anaphylaxis) and can save your life. 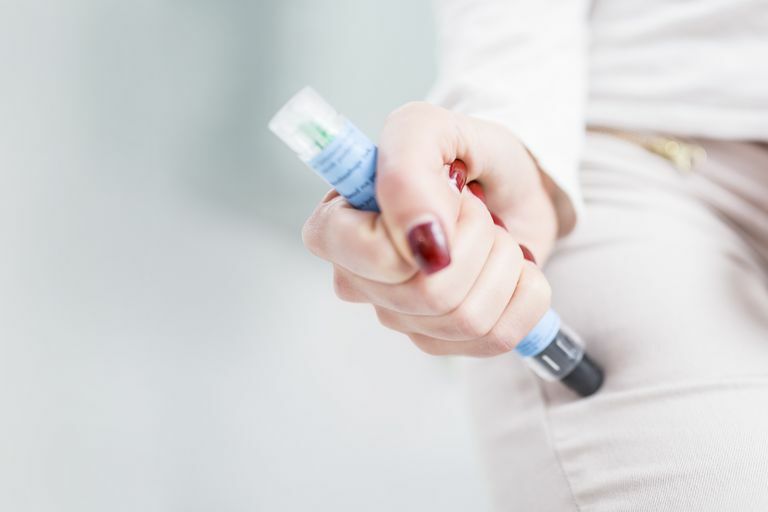 It is often prescribed to individuals at risk of a severe allergic reaction as an auto-injector which can be given as a shot into the muscle at the first sign of anaphylaxis. It reverses symptoms such as difficulty breathing, wheezing, swelling, and confusion. Epinephrine is a hormone that is produced by the body and we can't live without. Combine this with the fact that it is used to treat allergic reactions and it becomes baffling when you hear reports of an epinephrine allergy. In most cases a true allergy to epinephrine doesn't exist. That's not to say that people who report epinephrine allergies have not had a legitimate and concerning reaction, they most definitely have. However, rather than a true allergic reaction the reaction may be explained as a severe side effect of epinephrine or an allergy to another ingredient in the medication they were given, such as a preservative. Side effects of epinephrine may include: pounding, rapid heart beat, sweating, vomiting, fainting, swelling, redness or rash at the injection site, nervousness, anxiety, difficulty breathing, headache, or shaking. Some of these effects are also caused by an anaphylactic reaction or can just be natural effects of adrenaline on the body which may be more pronounced in some people. The extent to which you may experience any of these side effects may also depend on the dose of epinephrine you are given relative to your body weight. Lidocaine is a local anesthetic used to treat pain and the combination of lidocaine and epinephrine is sometimes used in dentists offices. If you have had a negative reaction to epinephrine it warrants further investigation. You may need the help of a specialized doctor called an immunologist. You may need to research any preservatives, additives or combination medications that may have been in the epinephrine you were given and be tested for an allergy to each one of these individual substances. It should be noted that if you have a history of anaphylaxis your doctor may instruct you to use epinephrine regardless of a confirmed allergy to it or a previous negative reaction. That's because anaphylaxis is so life threatening that the benefits may outweigh the risks. You may want to look at options such as immunotherapy (allergy shots) to treat your condition. It will be important for you to be extra vigilant about avoiding any potential substance which may trigger an anaphylactic episode. You also will need to know how to recognize the first signs and symptoms of an anaphylactic reaction so that you can initiate treatment immediately. Always call 911 even if you have your own epinephrine and have administered it. Epinephrine Injection. Medline Plus. Updated May 2018. Epinephrine Allergy Rare. American Academy of Allergy Asthma and Immunology. Understanding the stress response. Harvard Health Publishing. Updated May 2018.